Shreyas Sen is an Assistant Professor in ECE, Purdue University. Dr. Sen received his Ph.D. from ECE, Georgia Tech in 2011 and has over 5 years of industry research experience in Intel Labs, Qualcomm and Rambus. His current research interests include circuits/systems for IoT, Biomedical and Security. Dr. Sen’s work has been covered by 30+ news releases worldwide, invited appearance on Indian National TV CNBC TV18 Young Turks Program and by Radio Interview on NPR subsidiary Lakeshore Public Radio. In 2018, Dr. Sen was chosen by MIT Technology Review as one of the top 10 Indian Inventors Worldwide under 35 (MIT TR35 India Award), for the invention of using the Human Body as a Wire, which has the potential to transform healthcare, neuroscience and human-computer interaction. He has co-authored 2 book chapters, over 120 journal and conference papers and has 15 patents granted/pending. 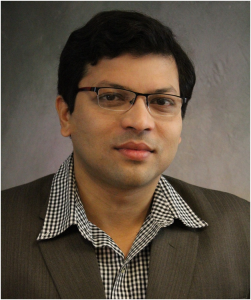 Dr. Sen is a recipient of the AFOSR Young Investigator Award 2016, NSF CISE CRII Award 2017, Google Faculty Research Award 2017, Intel Labs Divisional Recognition Award 2014 for industry-wide impact on USB-C type, Purdue HKN Beta Chapter Outstanding Professor Award 2018, Intel PhD Fellowship 2010, IEEE Microwave Fellowship 2008, GSRC Margarida Jacome Best Research Award 2007, Best Paper Awards at HOST 2017 and 2018, ICCAD Best-in-Track Award 2014, VTS Honorable Mention Award 2014, RWS Best Paper Award 2008, Intel Labs Quality Award 2012, SRC Inventor Recognition Award 2008 and Young Engineering Fellowship 2005. He serves/has served as an Associate Editor for IEEE Design & Test, Executive Committee member of IEEE Central Indiana Section, ETS and Technical Program Committee member of DAC, CICC, DATE, ISLPED, ICCAD, ITC, VLSI Design, IMSTW and VDAT. Dr. Sen is a Senior Member of IEEE. With the continued miniaturization of unit computing, in foreseeable future, humans will be immersed in connected sensing and computing devices that form a complex distributed network connected to the cloud. Like the devices itself, humans are integral part of such networks designed to improve quality of human lives. The number of wearable devices are expected to grow to 600 million by 2020. These wearable/implanted devices present in, on and around the human body forms a complex network of sensor, actuation, computation, storage, communication and energy nodes on a human body, namely the Internet of Body (IoB). IoB devices are typically interconnected using wireless body area network (WBAN) that suffers from connectivity bottleneck due to (1) high energy-cost of WBAN connectivity and (2) large data traffic through energy-sparse size-constrained devices. This talk will highlight how (1) Human Body Communication (HBC) provides an alternate energy-efficient and secure communication medium between wearable/implantable devices by using the human body as a conducting medium and provide order of magnitude improvement in physical security (as the critical information is contained within the human body and cannot be snooped on unless the person is physically touched) and energy-efficiency (due to low loss and broadband electrical conduction properties of human body). The science of signal propagation through human body will be explained using unifying BioPhysical models, followed by custom integrated circuit design that leverages the understanding to achieve >100x better energy-efficiency, compared to WBAN. (2) The edge-nodes will generate high data traffic leading to low battery-lifetime and increased network congestion. We will highlight how Context-aware Edge-analytics in IoB promises significant reduction in data-traffic without much loss of information content. This talk will conclude by highlighting how the combined benefit of HBC and Edge-analytics has the potential to transform Healthcare, Human Computer Interaction (HCI) and Neuroscience using IoB.